“Eventually, all things merge into one, and a river runs through it,” Norman Maclean writes in the last lines of his autobiographical meditation on family, faith, and fly fishing, A River Runs Through It: “The river was cut by the world’s great flood and runs over rocks from the basement of time. On some of those rocks are timeless raindrops. Under the rocks are the words, and some of the words are theirs. I am haunted by waters.” I couldn’t help but think of these words as I watched Jeff Nichol’s Mud, a down in the delta coming of age story that takes place in the wide mythic space where the Mississippi opens up and the horizon stretches boldly to infinity, expanding to encompass the whole world. On that threshold, reality and illusion, the past and the future, the sky and the river become one, and all things merge, pregnant with promise and hope. But the unstill Southern waters Nichols wades in are as murky and dangerous as the past of the movie’s title character, a tattooed, broken-toothed bayou noir hero who cares about honor and justice more than he’d like to admit. With a graceful, unhurried rhythm and a rustic regional temperament, the movie reaches the patience and picturesque pastoral sights of a Terrence Malick film. Unlike Malick, however, the director of Mud places his characters firmly within their setting but also above it, offering subtleties and surprises in the way of suspense, humor, and a climax that would put many an action film to shame. His Arkansas adolescent adventure follows Ellis (an exceptional Tye Sheridan in only his second role), a quietly intelligent young teen whose hooded eyes betray an understanding and longing well beyond his years. He’s a bit too haughty for his health; only one character asks him if he really likes to fight—after the third instance he punches someone older and bigger in the face—but the question is on everybody’s lips, including the audience’s. Navigating problems at home—a ramshackle shack built on the water— and the first pangs of love, Ellis relies on best friend Neckbone (a memorable and hilarious Jacob Lofland), his comic relief sidekick and opposite in every way. Where Ellis is wistful, Neckbone is cynical; where Ellis is impulsive, his friend is pragmatic. On a small island on the river, the boys find a ready-made tree house, a wrecked boat stranded high in the branches by the last flood. Judging by the trail of bread crumbs and Penthouse magazines, a man has already taken up residence in the suspended boat. His name is Mud (Matthew McConaughy), and he is as coarse, common, and disreputable as dirt. A wanted man because of some as yet unspecified crime, the slippery fugitive is, however, charming more than sinister, and soon the kids find themselves supplying him with food and carrying messages into town and back. Ellis helps Mud because he thinks it’s the right thing to do. Neckbone has his eye on the man’s gun, Mud’s only form of protection besides a lucky shirt and the crosses in his heels meant to ward off evil spirits. McConaughy, as we’ve never seen him before, cuts a wily outlaw as a redneck Romeo whose poise and wit mask a history of troubles only half-hinted at. Ellis finds a kindred romantic spirit in the leathery loner who’s almost feral in his resolve to reconnect with his girlfriend Juniper (Reese Witherspoon), the first and only true love of his life and reason Mud’s in hiding. This romance fuels the boy’s innocent hope even while his disillusionment with love, loyalty, and life steadily grows as he’s introduced to the hard, violent facts of adult life. Ellis and Neckbone are quick to believe Mud’s embroidered stories and look up to him as a father figure both boys are in desperate need of, as Ellis’s parents (Sarah Paulson and Ray McKinnon) are struggling with hard times and a failing marriage, and Neckbone is being raised by a feckless, wayward uncle (Michael Shannon, the director’s muse and former leading man in Shotgun Stories and Take Shelter).Sam Shepard plays a mysterious, weary, weather-beaten recluse who blames all of Mud’s misfortunes on Witherspoon’s hard-edged femme fatale. The plot, however, is secondary to the gradual transformation of the film’s young character and the almost palpable, splendid setting and atmosphere of this Southern fable. 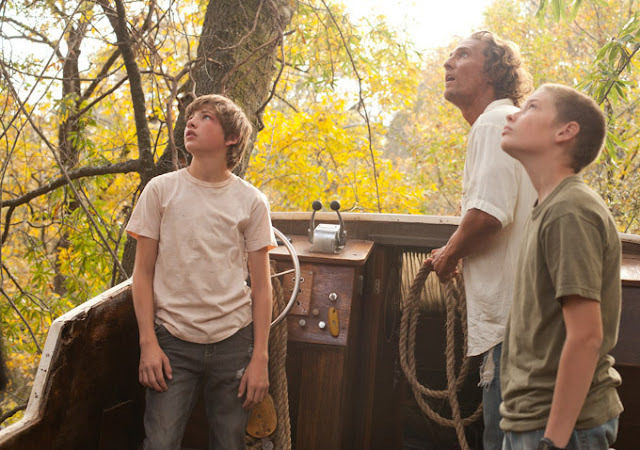 The film might seem like a modern-day retelling of Tom Sawyer or Huckleberry Finn, but Mud is its own distinct creature, filled with touches of brilliance and inspiration. To watch it is to go on a journey of rediscovery—of basic human values, as well as of a very decent, honest, straightforward kind of filmmaking. Adam Stone’s ingenious, sun-kissed cinematography and David Wingo’s soft swampy score drench Mud in the summer humidity and salty, mosquito-filled air of the Mississippi Delta, adding a note of lyricism without interfering with the film’s sobering realism. The movie doesn’t romanticize, condemn, or condescend rural poverty or the characters’ dogged determination to retain a rapidly disappearing way of life. Balancing between the naturalistic and the fantastic, Nichols bravely focuses in on houses on water, boats in trees, and other gentle, glorious impossibilities of nature and man. 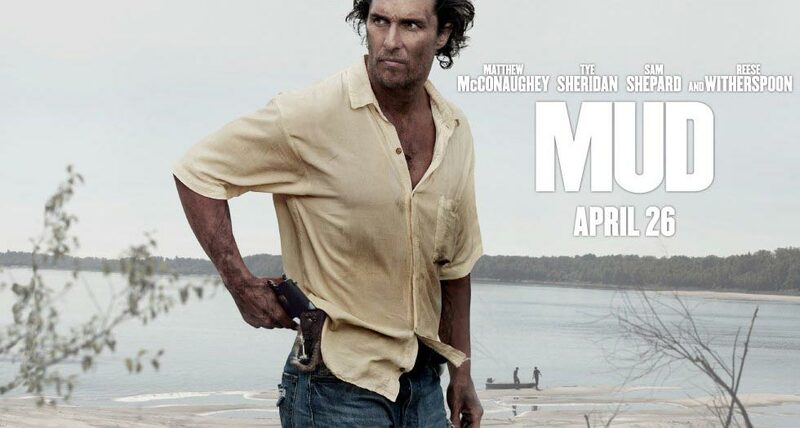 His Mud is a thing of bruised, battered beauty which, with confidence and courageous originality, navigates winding waterways and lights out for uncharted cinematic territory.